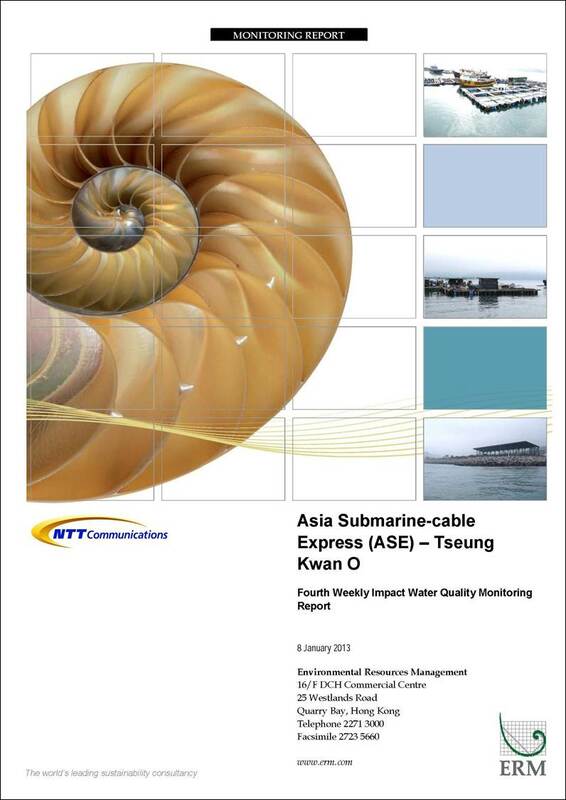 The submarine-cable installation works for the Asia Submarine-cable Express (ASE) cable system were commenced on 8 October 2012. This is the Fourth Weekly Impact Water Quality Monitoring Report presenting the impact water quality monitoring conducted during the period from 24 December 2012 to 30 December 2012 in accordance with the Monitoring and Audit Manual (EM&A Manual). During the reporting period, submarine-cable post-installation works, which involved diver jetting burial, were conducted in Zone A. Three monitoring events were scheduled in the reporting period in Zone A. Monitoring events at designated monitoring stations in Zone A were performed on schedule. Exceedances of Action Level were recorded during the reporting week. However, the exceedances were considered to reflect natural background fluctuation rather than impact caused by the Project. By the end of this reporting week, submarine-cable installation and post-installation works in which jetting works are involved have been completed. If no accident, impact water quality monitoring would not be required for the Project henceforth. 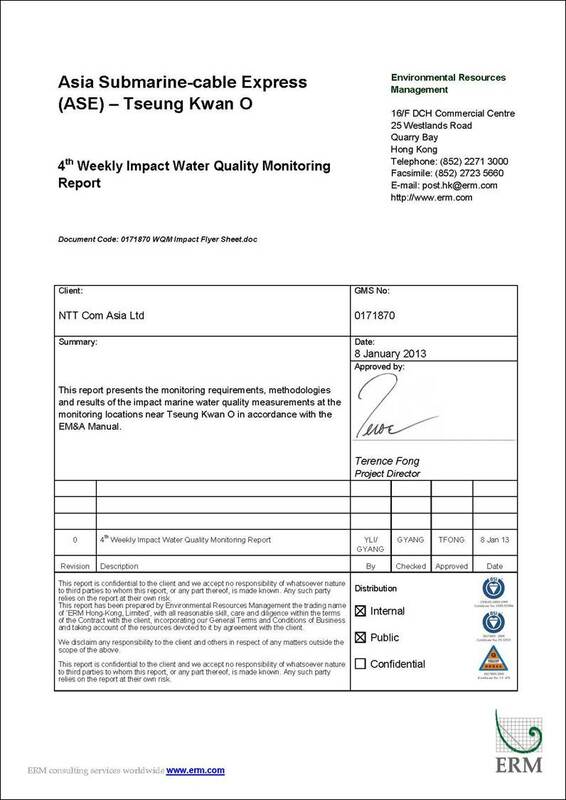 This is the Fourth Weekly Impact Water Quality Monitoring Report, which summarises the results of impact water quality monitoring as part of the EM&A programme during the reporting period from 24 December 2012 to 30 December 2012. Summarises the monitoring schedule for the next reporting period (if any). During this reporting week, the post-installation works that involved hand jetting were conducted in Zone A. This Report therefore presents the monitoring results from the monitoring stations within Zone A. During the reporting period from 24 December 2012 to 30 December 2012, post-installation works that involved hand jetting by diver were conducted in Zone A. In accordance with the EM&A Manual, marine water samples were collected at the stations situated around the submarine-cable protection works at the crossing point with DSD sewage pipe in Zone A. Hand jetting was involved in the protection works. The locations of the sampling stations within Zone A are shown in Figure 3.1. Due to the weather conditions and travelling time between stations, in-situ and SS measurements were taken at the impact monitoring stations with an approximately four-hour interval in Zone A. The monitoring frequency and parameters for Impact Monitoring are summarised in Table 3.3. The Action and Limit levels for Zones A, which were established based on the results of Baseline Environmental Monitoring (Zone A), are presented in Table 3.4. A total of three monitoring events were scheduled in the reporting period between 24 December 2012 and 30 December 2012 (Annex A). Monitoring events at all designated monitoring stations within Zone A were performed on schedule. No major activities influencing the water quality were identified during the reporting period. Continuous water sampling was taken at the impact monitoring stations in Zone A at approximately 4-hour intervals (subject to the weather conditions and travelling time between stations) on a daily basis. In general, the water quality of Zone A was stable throughout each sampling day though natural fluctuation existed. Neither sudden drop in dissolved oxygen concentrations nor sharp increase in turbidity levels and suspended solid levels were observed on each monitoring day. The results of the impact monitoring and their graphical presentations were included in Annex C.
Exceedances of the Action Level in depth-averaged SS were recorded at Impact Stations E7, E8, E9, F1, S1, S2 and S3 in the 1st, 2nd, 3rd and 4th sampling rounds on 27 December 2012 (Table 4.2). According to the daily barge operation report, there was preparation and equipment setting up works carried out by the Contractor before the hand jetting works, which commenced at 14:00. The water jetting works stopped at approximately 16:00 due to strong current. The actual time of hand jetting works on 27 December 2012 was between 14:00 to 16:00. This period overlapped with the marine water quality monitoring. Hand jetting works for the Project did not start when the exceedances were recorded at all monitoring stations (i.e. C1, G1, G2, G3, E8, S1, E7, F1, E9, S2 and S3) in the 1st round (07:00 – 10:50) of marine water quality monitoring. Therefore, the exceedances of the Action Level at in the 1st sampling round are considered as representing natural background fluctuations rather than the result of the cable protection (hand jetting) works. For the exceedances in the 2nd and 3rd rounds of water quality sampling, considering the generally elevated Depth-averaged SS levels compared with the baseline data at all monitoring stations including the Control Station C1 to the east of Lei Yun Mun, it is unlikely that the localised and small scaled hand jetting (a total of only 13 m cable buried) can cause SS elevation of such scale. Attention should also be given to the fact that such exceedances at all sampling stations occurred at the 1st round of water quality sampling before the hand jetting works started. It is hence considered that the Depth-averaged SS exceedances at the 2nd and 3rd rounds of sampling may represent a natural phenomenon and overall elevation in the background Depth-averaged SS level, which is not related to the diver burial operation of the Project. Given the discussion as above, the exceedances of the Action Level at all impact stations in the 4th round of sampling (19:10 – 23:06) are unlikely to be caused by the Project either. Rather, the exceedances are considered to be a continuum of the performance of the natural background conditions for the day. Exceedances of the Action Level in depth-averaged SS were recorded at Impact Stations E7, E8, E9, F1, S1, S2 and S3 in the 1st, 2nd, 3rd and 4th sampling rounds on 28 December 2012 (Table 4.3). According to the daily barge operation report of 28 December 2012, there was preparation and equipment setting up works carried out by the Contractor before the hand jetting works, which commenced at 10:30. The water jetting works stopped at approximately 19:00 for the day. The actual time of hand jetting works on 28 December 2012 was between 10:30 to 19:00. This period overlapped with the marine water quality monitoring..
Hand jetting works for the Project did not start when the exceedances were recorded at all monitoring stations (i.e. 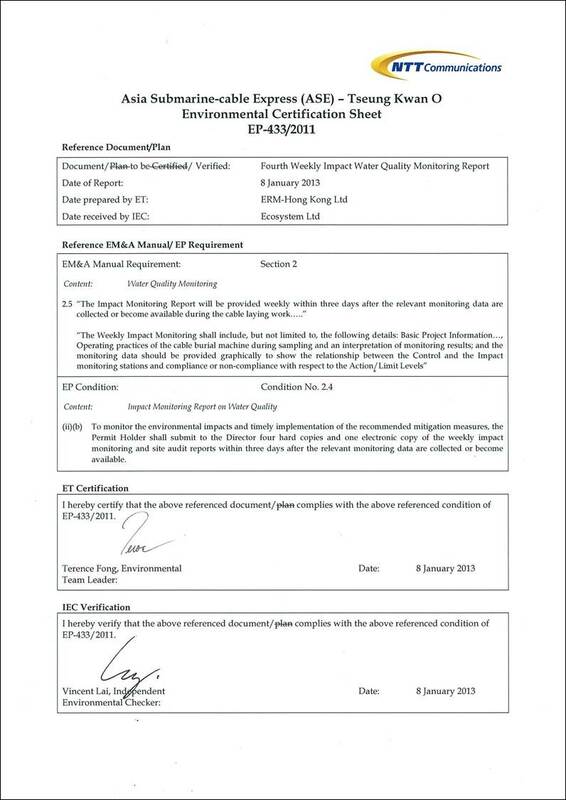 C1, G1, G2, G3, E8, E7, F1, E9, S1 and S2) except S3 in the 1st round (07:00 – 10:21) of marine water quality monitoring. Therefore, the exceedances of the Action Level at these stations in the 1st sampling round are considered as representing natural background fluctuations rather than a result of the cable protection (hand jetting) works. For the exceedances at impact station S3 in the 1st round of water quality sampling and all monitoring stations in the 2nd and 3rd rounds, considering the generally elevated Depth-averaged SS levels compared with the baseline data at all monitoring stations including the Control Station C1 to the east of Lei Yun Mun, it is unlikely that the localised and small scaled hand jetting (a total of only 42 m cable buried) can cause SS elevation of such scale. Attention should also be given to the fact that such exceedances at all sampling stations (except S3) occurred at the 1st round of water quality sampling before the hand jetting works started. It is hence considered that the Depth-averaged SS exceedances at the 2nd and 3rd rounds of sampling may represent a natural phenomenon and overall elevation in the background Depth-averaged SS level, which is not related to the diver burial operation of the Project. Given the discussion as above, the exceedances of the Action Level at all impact stations in the 4th round of sampling (19:10 – 23:04) are unlikely to be caused by the Project either. Rather, the exceedances are considered to be a continuum of the performance of the natural background conditions for the day. Exceedances of the Action Level in depth-averaged SS were recorded at Impact Station E7, E8, E9, F1, S1, S2 and S3 in the 1st, 2nd, 3rd and 4th sampling rounds on 29 December 2012 (Table 4.4). According to the daily barge operation report of 29 December 2012, there was preparation and equipment setting up works carried out by the Contractor before the hand jetting works, which commenced at 10:30. The water jetting works stopped at approximately 19:00 for the day. The actual time of hand jetting works on 29 December 2012 was between 10:30 to 19:00. This period overlapped with the marine water quality monitoring. Hand jetting works for the Project did not start when the exceedances were recorded at all monitoring stations (i.e. C1, G1, G2, G3, E8, E7, F1, E9, S1 and S2) except S3 in the 1st round (07:00 – 10:22) of marine water quality monitoring. Therefore, the exceedances of the Action Level at these stations in the 1st sampling round are considered as representing natural background fluctuations rather than a result of the cable protection (hand jetting) works. For the exceedances at impact station S3 in the 1st round of water quality sampling and all monitoring stations in the 2nd and 3rd rounds, considering the generally elevated Depth-averaged SS levels compared with the baseline data at all monitoring stations including the Control Station C1 to the east of Lei Yun Mun, it is unlikely that the localised and small scaled hand jetting (a total of only 64 m cable buried) can cause SS elevation of such scale. Attention should also be given to the fact that such exceedances at all sampling stations (except S3) occurred at the 1st round of water quality sampling before the hand jetting works started. It is hence considered that the Depth-averaged SS exceedances at the 2nd and 3rd rounds of sampling may represent a natural phenomenon and overall elevation in the background Depth-averaged SS level, which is not related to the diver burial operation of the Project. Given the discussion as above, the exceedances of the Action Level at all impact stations in the 4th round of sampling (19:08 – 22:55) are unlikely to be caused by the Project either. Rather, the exceedances are considered to be a continuum of the performance of the natural background conditions for the day. Exceedances of the Action Level were recorded during the reporting period. The Event and Action Plan for the identified exceedances were implemented and followed the procedures as stipulated in the EM&A Manual and Table 3.4. It was concluded that the exceedances were considered to reflect natural background fluctuation rather than the impact caused by the Project (See Section 4.2 for details). By the end of this reporting week, submarine-cable installation and post-installation works, in which jetting works are involved, have been completed. Given the completion of the marine construction phase involving jetting works of this project, no jetting works of any types are expected to be carried out except for any accidence in the future that requires the said task. Since no jetting works are anticipated for the Project, impact water quality monitoring would not be required henceforth if no accidence. This Weekly Impact Monitoring Report presents the results of impact water quality monitoring undertaken in Zone A during the period from 24 December 2012 to 30 December 2012 in accordance with the EM&A Manual and the requirements under Environmental Permit (EP - 433/2011). Water quality in Zone A was generally stable throughout the sampling period. Neither sudden drop in dissolved oxygen concentrations nor sharp increase in turbidity levels and suspended solid levels were observed. Exceedances of Action Level were recorded during the reporting week, but they are considered to reflect natural background fluctuation rather than impact caused by the Project. By the end of this reporting week, submarine-cable installation and post-installation works, in which jetting works are involved, have been completed. Since no jetting works are anticipated for the Project in future, impact water quality monitoring would not be required henceforth if no accidence.